This is a fun Georgian paste intaglio, dating to the 18th century. It is produced from a doublet, painted on the inside with a floral spray of pigment - to resemble a moss agate gem. The intaglio is designed to imitate Renaissance gems, depicting a muse or courtesan. 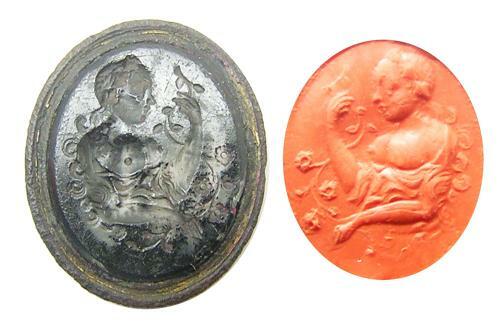 Such an intaglio would have been hung on a fob seal, the frame is all that sadly remains. PROVENANCE: Found near Chelmsford, Essex.